Sony BDV-E380 review | What Hi-Fi? For the style-conscious, the BDV-E380 could be just the thing. In a departure from the non-descript rectangular boxes served up by its rivals, this Sony’s main unit is slightly beefier in size, but has a smooth, glossy, sloping front. There’s a row of touch-sensitive buttons too. The main unit certainly stands out from the crowd, then; but it attracts the odd fingerprint smear or three, and the display is at such an angle, and so reflective, that you struggle to read it. The satellites, too, show a few stylish touches – they’re cylindrical in shape and lean back ever so slightly. The centre channel is much slimmer, fortunately, so your view won’t be obstructed if you need to have it in front of your screen. Connectivity is in line with the rival systems in this test. A wi-fi dongle costs extra, but you do get two HDMI inputs. Sony used to charge extra for the privilege of having an iPod dock, so the fact that you now get one in the box makes for a welcome change. It connects to the main unit via one of two USB sockets found on the receiver. The Sony also features its own speaker calibration system. It’s worth noting that the set-up mic’s input is on the back of the receiver, which can prove tricky if you’ve already squeezed it into a narrow space on your rack. Compared with previous generations of Sony system, the auto-calibration takes a little longer, but we’re only talking seconds and the results are still accurate; only a minimal tweak of the subwoofer level is required. Hop online and you’ll use Sony’s Bravia Internet Video portal to access on-demand and catch-up content. There’s plenty to choose from, including services such as BBC iPlayer and Demand 5. Fed the Despicable Me 3D Blu-ray, the Sony produces a dramatic 3D picture. There’s an impressive sense of depth and layering of effects. The same can be said when switching to a 2D disc. In Harry Potter, the interior of the Ministry of Magic looks grand and spacious. As Harry, Hermione, and Ron attempt to flee, the Sony keeps edges in check and motion blurring to a bare minimum. 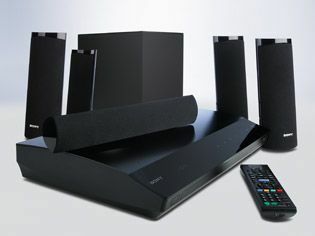 The Sony sounds leaner than some, but, despite greater emphasis on higher frequencies, the system doesn’t sound particularly brash or unrefined. Instead, it lends itself to a crisp, clear and airy presentation. When Harry, Ron and Hermione make short work of two Death Eaters in the café, the Sony sounds punchy, precise and to the point. Play a tune or three through the iPod dock and it displays good timing and agility. It could do, though, with a bit of extra bass weight and richness. This Sony is a decent performer. If its looks appeal to you, it might be just the thing you’re looking for.